This magnificent Necklace features the CLASSY & DAZZLING looks of it's own. The Yellow Pearls & Nugggets chips accented in beautiful Necklace & Matching Nickle Free French Hook Earrings Set are just GORGEOUS! Exclusively for the BridesmaidWedding beautifying the wardrobes to the ultimate touch of BEAUTY! 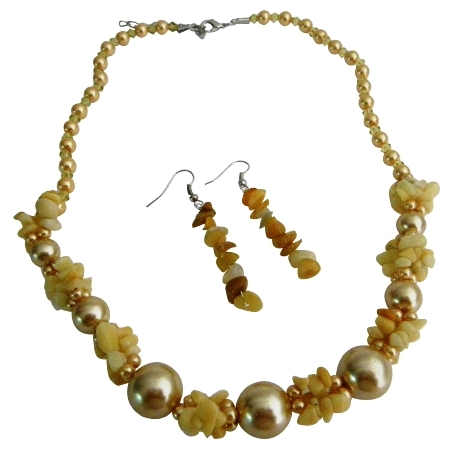 !.This yellow pearls Jewelry is also for all the occasions adding chic elegance & charms!!. All time Festive.